New prisoners have arrived at Stalag 18. 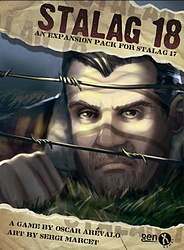 They will help with the player's escape plans, providing a better chance of success, Stalag 18 includes new actiosn and speialized prisoners whose skill permit the players easier combinations to escape. Now players can be informers for the guards! Moreover this expansion has all you need to play with a 6th player.